The Armouraires have over 48 years combined ministry experience, and they will bring a ministry experience to you as well! They feel their mission is to go where God leads and let the Lord use their personal testimonies and music to spread the Gospel of Jesus Christ! They provide a caring, sharing and healing performance which will, as the expression of God's grace, equip believers and transform the broken, battered and forsaken. The members of the Armouraires come from a variety of diverse musical and spiritual backgrounds, but God has blended them together into a force for the Kingdom! and what a force they've become! 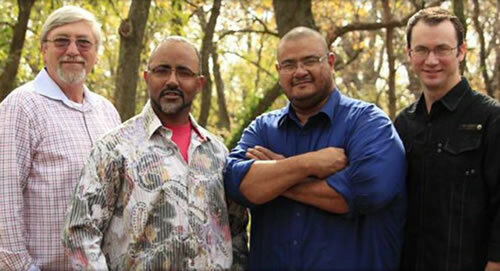 The Armouraires Quartet is recognized throughout the gospel music industry for their excellence in ministry, including four nominations for Artists Music Guild Group of they Year. They've received recognition as the Mid-West Group of the Year from 2012 to 2015, Midwest Ambassadors of the Year in 2014, Song of the Year in 2013 and 2016, and Midwest Live Album of the Year in 2017! Yet they remain humble and faithful servants to the Savior! Living in a society that challenges families and individuals, the Armouraires commit their lives to empower those they meet to resist challenges that could threaten their very existence! As one of their members put it, "We thank God for His many blessings He has bestowed upon each of us. If it wasn't for His grace and mercy, none of what we've been blessed to do would be possible. For that, we as a group give ALL glory and honor to Our Lord and Savior Jesus Christ!" If you would like to book the Armouraires Quartet to minister in your next event, contact them using the information at the top of this screen.